A butterfly chrysalis is truly a precious gem of the natural world. Give your loved ones the thrill of a lifetime as they watch a stunning butterfly emerge from Butterfly Adventures’ live chrysalis kit. Evoke those childhood memories of ‘a wish upon the wing’ by whispering your wish to the butterfly before releasing it. Perfect for weddings, birthdays, and as a powerful healing symbol of new life and new hope. We will try to send you the Monarch chrysalises when we can but at different times of the year there are limitations in availability and we will send the species available at the time. Butterfly chrysalises come in very different shapes: green or brown, smooth or slightly spiked and some can even wriggle! Please let us know, if you only want a Monarch but this could mean a longer wait. Please allow up to 2 weeks (hopefully less!) for the delivery. We use AusPost and Tall for overnight delivery to minimise the time in transit for this precious cargo but it is almost impossible to send them straight away as we almost always have a waiting queue for the orders. Single chrysalises to refill your chrysalis kit and watch the metamorphosis again! Releasing or keeping your butterflies. Butterflies require 20C or higher to fly. They will be sleepy at lower temperatures. 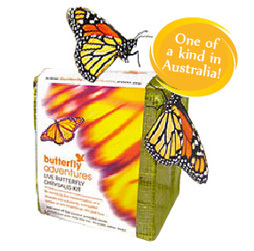 The mesh cube supplied is NOT suitable for keeping butterflies for longer than 1-2 days. If it is cold where you are, you have an option of making a larger enclosure yourself or buying one from our shop. The butterflies can be kept as pets in a larger enclosure for 3-4 weeks, you just need to feed them. It is easy to feed butterflies. Soak a paper towel in sugary water (1-2 teaspoons of sugar per glass of water) and place it on top of the enclosure. Butterflies are attracted to light and always hang out at the top of the enclosure. This is where you place your paper towel. You can also put one at the bottom of the cage, just in case. Additionally, its a very good idea to mist the mesh of your enclosure with water to keep the butterflies hydrated. Important: the chrysalis contains a live material, and it is important to minimise the time in transit. Make sure you remove the chrysalis from its packaging as soon as the kit arrives, and avoid sending it anywhere else upon arrival. Carefully remove the chrysalis from its protective packaging and hang it from the center of the lid of the box. 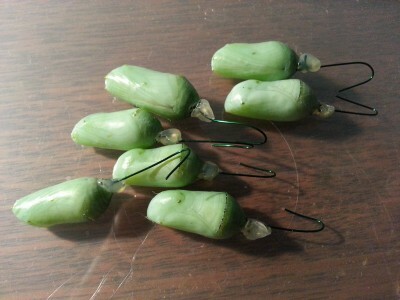 The chrysalis will come with a little wire hook attached to it, so that you can hang it like a pendant. Keep the chrysalis away from direct sun, and mist with water once a day. Don’t mist if the droplets of water are still present on the chrysalis the next day. Stop misting once the chrysalis begins to darken. NEVER use any kind of insecticides in the same room with your chrysalis kit.